Lomu was at the vanguard of the advent of giant wingers and still holds the record for the highest number of tries scored, 15, in Rugby World Cup history despite having to retire following serious illness whilst still in his prime. His standout appearance saw him bag four tries against England in the 1995 semi-final. Bryan Habana is closing in on the record and, at the start of the 2015 tournament, stood just 5 tries away from equalling this impressive record sitting alongside Shane Williams the diminutive Amman Valley wizard on 10 tries. This year’s David has to be Matthew Morgan, the pint-pot Bristol RFC player who has rightly commanded a place in manager Warren Gatland’s final squad. By the time you are reading this we will have already witnessed his magical feet and his ability, rare in the modern game, of creating opportunity for those around him by evading the big powerful defences upon which so much importance is placed. His stats put him firmly in the David camp standing at 5’8” and weighing in at just over 12 stone. 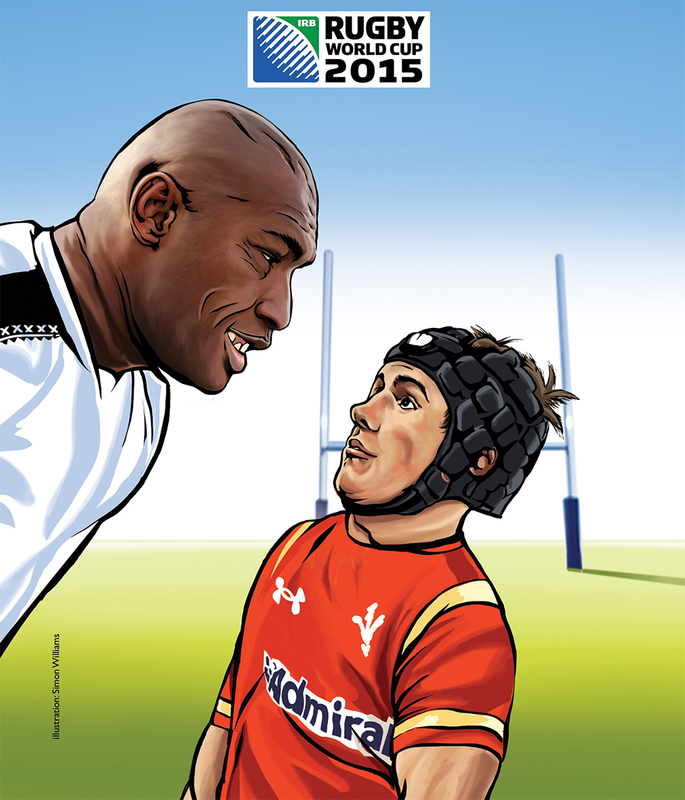 The Goliath of the tournament will undoubtedly be the flying Fijian force that is Nemani Nadolo. Weighing in at a solid 20 stone and standing 6’4” tall he is a big unit. But he is not just about size as his 100m time reflects – he is just a second off Usain Bolt’s pace for the sprint! I’m just glad that it’s not going to be me standing in the back three for Wales when he comes to town. Whilst it is said that “the bigger they are, the harder they fall” there is a high degree of courage, conviction and technique going to be needed to stop this juggernaut in open space. With more and more Fijian players plying their trade around the world nobody should expect a 66-0 scoreline as seen in the last World Cup in Wales’ favour this time around. Could they prove to be the team that delivers a shock result against one of the bigger teams in Pool A? The 20 stone player by the way is not limited to international teams. There are plenty to be seen turning out for club teams week in, week out but their size is less likely to have been acquired in the gym than in the bar over many long seasons! So, the David and Goliath story is not one of disadvantage per se but one where the underdog can approach in a positive mind-set and outwit, out-manoeuvre and ultimately come out victorious. This clash is just one of many mouth-watering individual clashes in the tournament. Can Wales repeat the progress that so captured the nation back in 2011 and lift the Welsh spirits like no other known drug? By the time that this is being read we will either be on a high having dispensed with Uruguay and Fiji before beating England in a thrilling encounter at Twickenham or we will be in the depths of despair hoping for a result against the Australians to give us a lifeline in the Pool of Death. Let’s hope for the former and look forward to enjoying the big matches on the big screen at the club with good beer and an electric atmosphere.